The French speaking Canadian province of Quebec saw more than 20,000 angry bikers blocking its roads last Sunday in protest at incredibly high registration fees imposed on them by the local authorities. This was the second demonstration in the space of a week and numbers were more than six times higher than the first time round. 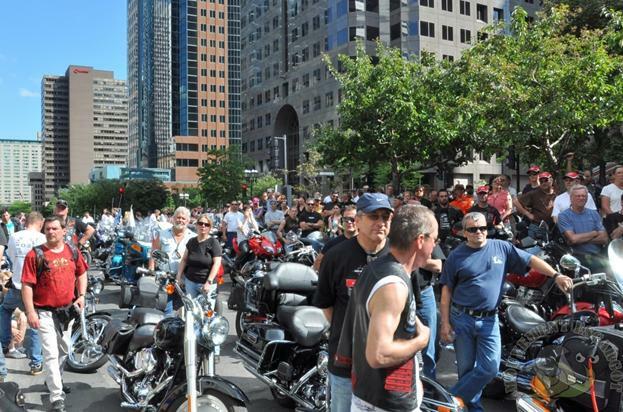 The bikers gathered in three different locations around Montreal (Terrebonne, Anjou and Dorval) and took over the roads en masse at the minimum legal speed of 60 kms/hour on motorways and 30 kms/hour on all other roads. They each occupied the space that a car would normally take, leaving plenty of space between them and preventing any other vehicle from squeezing in between them. Within minutes, the outskirts of the Quebec capital were brought to a complete standstill, with thousands of cars, lorries, buses and coaches remaining stationary for hours. As there were three different meeting points for this demonstration, the bikers caused complete gridlock in three different locations at the same time, thus causing chaos absolutely everywhere. 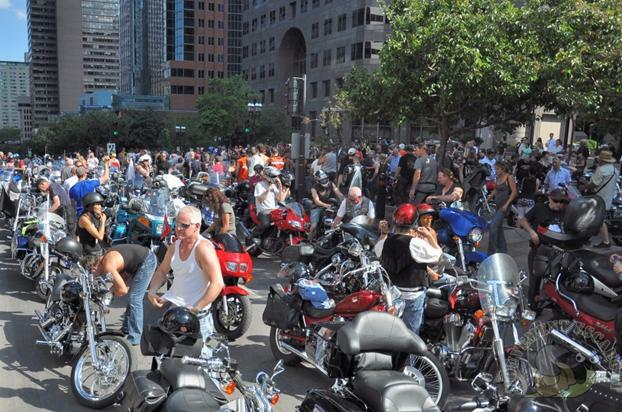 Once congestion had reached its maximum level and they made sure that it would take hours for the traffic to come back to normal, the bikers started to filter through the mayhem they had caused and rode towards Central Montreal to gather outside the Prime Minister’s office, Jean Charest, on McGill College Avenue. According to Eric Lessard, Head of the Mouvement Escargot, a motorcycle protest group permanently established in the French speaking province, registration fees for motorcycles in Quebec have almost doubled between 2007 and 2010, from CA$ 320 to CA$ 627. The authorities argue that because motorcycles are a more dangerous mode of transport than others, it is important to limit the number of bikes on the roads and make them less attractive. But the French Canadian bikers don’t seem to agree and consider that they have nothing to learn from the authorities, as they are old and experienced enough to take their own responsibilities and risks. They are prepared to gridlock Montreal and its outskirts every week if need be, until the authorities bring motorcycle registration fees down to reasonable levels. We are amused to see how the French speaking world is more keen than ever to stand up against the authorities. With 40,000 bikers gridlocking France a couple of months ago and another demonstration planned for 18th June 2010 designed to bring the whole country to a complete halt, the Quebecois are well within their right to fight against their Government for treating them like cash cows. Britain now seems to join the party with thousands of bikers supporting the No To Bike Parking Tax campaign to protest at a parking tax imposed on them in Central London by Westminster City Council. Mouvement Escargot is planning many more demonstrations over the coming weeks in Montreal (the next one is scheduled for 12th June 2010), designed to cause maximum disruption all over the place, if their meeting with the Quebec Transport Minister on 10th June 2010 does not lead to an agreement. It’s really sad to get to a point where politicians are reluctant to listen to the public who specifically elected them to serve their interests. So the bikers, whether French, Canadian or British, have no alternative but take radical action that causes maximum disruption to everyone and everywhere. We are not going to be the new cash cows ! Not in Canada, not in the U.K not anywhere ! Another unfair tax by politicians; bikers are paying additional tax because their mode of transport has been designated more dangerous so treating their injuries is more expensive. Everyone knows that most (UK 93%) biker/scooterist accidents are not the motorcyclist’s fault and rarely is anyone other than the biker killed or injured. Car drivers on the other hand kill/injure far more people so logically the medical costs associated with their accidents must be greater. Why aren’t car registration fees being increased too ? I’ll tell you why – bikers have been thought of as a small insignificant group whose organisations don’t have the financial/political muscle possessed by the car manufacturer’s lobby. It seems that a world wide emergence of biker self-confidence is about to change this universal misconception. Une autre taxe injuste par les politicards; motards doivent payer des impôts supplémentaires a cause de leur mode de transport a été désigné plus dangereux et le traitement de leurs blessures coûtant cher. Tout le monde sait que la plupart (93% au Royaume Uni) des collisions de motard ne sont pas la faute du motard/scootard et très rarement quelqu’un d’autre que le motard/scootard est tué/blessés. Les conducteurs de voitures, d’autre part tuer/blesser des gens beaucoup plus, donc logiquement leur frais d’accident médicaux doit être supérieur. Pourquoi ne pas les frais d’immatriculation des bagnoles soulevées ? Je vais vous l’expliquer – les motards ont toujours considéré comme un petit groupe insignificant dont les organisation n’ont pas le flouse ni le piston politique possédé par les constructeurs d’automobiles. Il semble qu’ilyait un monde émergence éventail de confiance en soi parmi les motards/scootards ce qui entraînera un changement dans ce malentendu universel. It’s a shame that in a city like Montreal, where congestion due to automobiles is getting really bad, that they look at two wheeled vehicles as “toys” rather than valid modes of transit. They’ve removed hundreds of parking spaces to make room for their Bixie bike system for renting bicycles. It seems like they are trying to shift people away from cars to alternate forms of transit, but they don’t see motorcycles and scooters as viable options. I specifically bought a 125cc bike so I wouldn’t be driving my pickup truck alone downtown. Would they rather I be more wasteful and purchase a brand new Prius with built-in toxic batteries? Thank you Jay for your comments. Montreal is unfortunately not the only city in the world where the authorities don’t recognise motorcycles as a congestion free mode of transport, but they rather prefer to develop and promote their own solutions, which are expensive and thus cost money to the taxpayer. But the reason why the authorities want to develop their own solutions and kind of discourage people from using their own is purely because they want to look good and appear like they’re doing something. This is pure politics, these guys are only interested in getting re-elected, they don’t care about what individuals alone can do to help maintain a more healthy environment. Until people understand that those authorities who simply ban individual solutions for the benefit of public schemes are just doing pure spin, we will still be the victims of our own initiatives.